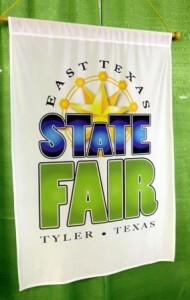 It’s almost time for the East Texas State Fair! This year it begins on Friday, September 22 and runs through Sunday, October 1 in Tyler, Texas. The East Texas State Fair is organized exclusively for charitable and educational purposes through the operation of this annual event promoting education, entertainment and the spirit of competition. The Fair is committed to agricultural heritage, families and service to the community. This year, it is again loaded with concerts, special attractions, family fun, kid’s activities, a livestock show, and much more. Find out more, get your tickets and view the event schedules on their website here.